The 2016 Los Angeles Rams season was the franchise's 79th season in the National Football League and the fifth and final under head coach Jeff Fisher. It was the franchise's 50th season in the Greater Los Angeles Area and the first since 1994. The team returned to Los Angeles after 21 seasons in St. Louis. The Rams decided from 2016-2019 to return to wearing white uniforms at home in LA as a nod to Fearsome Foursome era. In Week 15 against their NFC West Rival the Seattle Seahawks, the Rams used white horns on their helmet just for the one game only, a move which would be repeated for the entire following season. The 2016 season saw the Rams attempting to improve upon their 7–9 record from 2015. After a surprising 3–1 start, the Rams would massively struggle in the second half, going 1–11 in their final 12 games, en route to a 4–12 record. The Rams also went 1–6 at home in 2016, their worst home record since going 0–8 at home in their 1–15 2009 season. The Rams also missed the playoffs for the 12th straight season, the third longest current streak in the NFL. Only the Buffalo Bills and Cleveland Browns had longer postseason droughts. The franchise also clinched its 13th straight losing season, which as of 2017 was the longest current streak in the NFL. The Rams were also the only team to lose to the San Francisco 49ers in 2016, as both wins for the 49ers were against the Rams. On December 12, 2016, Fisher was fired after a 42-14 loss to the Atlanta Falcons that dropped the Rams to 4-9 and clinched their 10th straight losing season. John Fassel was named interim head coach and went winless over the final three games. After receiving permission to void its lease on the Edward Jones Dome in St. Louis during the 2015 season, the team officially filed an application to relocate back to Los Angeles on January 4, 2016, where it would play at the Los Angeles Stadium at Hollywood Park in Inglewood when completed; construction began in December 2015, and the opening is scheduled for 2020. In the interim, the Rams would play seven of their home games at the Los Angeles Memorial Coliseum, and the eighth game at Twickenham Stadium in London as part of the NFL International Series, until the Los Angeles at Hollywood Park Stadium would be complete. The Rams also resumed holding training camp at UC Irvine, where they had previously held training camp during the 1990s prior to the move to St. Louis. The Rams competed against the San Diego Chargers and Oakland Raiders, both of whom also filed relocation requests for a joint stadium in Carson for the rights to the Los Angeles market; the Chargers received a one-year option to decide if they wanted to share the Inglewood stadium with the Rams, which they did in the following season in 2017. Had the Chargers not accepted the option, a one-year option would have been granted to the Raiders after theirs expired. The league made their decision in a special meeting on January 12; after two ballots, the Rams' proposal was accepted on a 30–2 vote. The Rams' return to the Greater Los Angeles Area received extensive media coverage. The team made its first appearance on HBO's Hard Knocks, which covered training camp and preseason. Several players and their families were followed on the new E! reality series Hollywood & Football as they settled in Southern California, while the regular season was later chronicled in the Amazon Prime sports documentary series All Or Nothing. The Coliseum was previously the Rams' home for 34 seasons (1946–1979); they moved to Anaheim Stadium in Orange County in 1980, and played there for fifteen seasons before the move to St. Louis in 1995. The Rams acquired the No. 1 overall pick from the Tennessee Titans along with a 4th and 6th round selections in exchange for the Rams No. 15 overall pick, two second-round picks, and a third-round pick in the 2016 draft. The Titans also received the Rams first and third-round picks in 2017. The Rams acquired an additional second-round selection as part of a trade that sent quarterback Sam Bradford to the Philadelphia Eagles. This selection along with their original second-round pick were traded for the number one overall selection of the 2017 draft. The Rams will forfeit their fifth-round selection after selecting offensive tackle Isaiah Battle in the 2015 Supplemental draft. The Rams traded their seventh-round selection to the Houston Texans in exchange for quarterback Case Keenum. On November 25, 2015, the NFL announced that the Rams would play host to a then-undetermined NFC East opponent in the International Series, in the first-ever game at Twickenham Stadium in London, United Kingdom. On January 3, 2016, the New York Giants were confirmed as the Rams' opponent for this game, both teams having finished in third place in their respective divisions in the 2015 season. The game was played in Week 7 on Sunday, October 23. The kickoff time was announced on April 14, and both teams had their bye the following week. As a condition of the Rams' use of the Coliseum, the University of Southern California requested that the NFL not schedule any Monday night home games at the stadium, nor any home games on days after USC football games. While the team's final schedule did not contain any home Monday night games, two games were played on days following an USC home game. The Rams wore their white uniforms for all of their home games for the first time since 1971 as a nod to the Fearsome Foursome era, with the exception of wearing their throwback uniforms twice a year for home games and wearing their all-navy uniforms for the game in London. SF – Carlos Hyde 11-yard run (Phil Dawson kick), 3:24. 49ers 7–0. Drive: 10 plays, 52 yards, 3:18. SF – Shaun Draughn 3-yard run (Phil Dawson kick), 8:16. 49ers 14–0. Drive: 9 plays, 59 yards, 2:44. SF – Vance McDonald 8-yard pass from Blaine Gabbert (Phil Dawson kick), 12:07. 49ers 21–0. Drive: 10 plays, 77 yards, 3:55. SF – Carlos Hyde 1-yard run (Phil Dawson kick), 5:14. 49ers 28–0. Drive: 11 plays, 80 yards, 5:51. LA – Greg Zuerlein 39-yard field goal, 10:38. Rams 3–0. Drive: 9 plays, 54 yards, 4:22. SEA – Steven Hauschka 23-yard field goal, 14:45. Tied 3–3. Drive: 14 plays, 76 yards, 7:08. LA – Greg Zuerlein 28-yard field goal, 1:04. Rams 6–3. Drive: 9 plays, 70 yards, 3:15. LA – Greg Zuerlein 47-yard field goal, 14:10. Rams 9–3. Drive: 9 plays, 58 yards, 4:28. With the win, the Rams won a regular season game in Los Angeles for the first time since 1994. They paid tribute to their first regular season game back in Los Angeles by wearing their throwback uniforms, which were their uniforms in their last season in 1994. LA – Brian Quick 44-yard pass from Case Keenum (Greg Zuerlein kick), 12:05. Rams 7–0. Drive: 8 plays, 75 yards, 3:02. TB – Kwon Alexander 38-yard interception return (kick failed, wide left), 8:54. Rams 7–6. LA – Greg Zuerlein 53-yard field goal, 2:31. Rams 10–6. Drive: 8 plays, 53 yards, 3:42. TB – Charles Sims 1-yard run (Roberto Aguayo kick), 12:27. Buccaneers 13–10. Drive: 9 plays, 75 yards, 5:03. TB – Cameron Brate 3-yard pass from Jameis Winston (Roberto Aguayo kick), 6:10. Buccaneers 20–10. Drive: 9 plays, 57 yards, 4:48. LA – Todd Gurley 1-yard run (Greg Zuerlein kick), 0:28. Buccaneers 20–17. Drive: 7 plays, 78 yards, 2:01. LA – Todd Gurley 1-yard run (Greg Zuerlein kick), 0:53. Rams 24–20. Drive 8 plays, 69 yards, 3:52. LA – Ethan Westbrooks 77-yard fumble return (Greg Zuerlein kick), 11:56. Rams 31–20. TB – Cameron Brate 1-yard touchdown (pass failed), 9:00. Rams 31–26. Drive: 7 plays, 75 yards, 2:44. LA – Tavon Austin 43-yard pass from Case Keenum (run failed), 3:39. Rams 37–26. Drive: 7 plays, 75 yards, 4:17. TB – Mike Evans 7-yard pass from Jameis Winston (pass failed), 2:24. Rams 37–32. Drive 11 plays, 75 yards, 2:23. In what was a game that pitted both teams offenses and defenses together, the Rams won 37–32 with their defense securing the victory at the end of the game and scoring at least 5 touchdowns. With the win, the Rams record improved to 2–1 for the first time since 2006, placing the team in first place in the NFC West. It was also the first time the Rams scored a regular season touchdown as the Los Angeles Rams since 1994. LA – Brian Quick 65-yard pass from Case Keenum (Greg Zuerlein kick), 1:59. Rams 7–0. Drive: 7 plays, 90 yards, 3:28. ARI – Chandler Catanzaro 25-yard field goal, 12:19. Rams 7–3. Drive: 12 plays, 68 yards, 4:40. LA – Greg Zuerlein 29-yard field goal, 8:42. Rams 10–3. Drive: 8 plays, 64 yards, 3:37. ARI – Michael Floyd 5-yard pass from Carson Palmer (Chandler Catanzaro kick), 0:24. Tied 10–10. Drive: 8 plays, 80 yards, 1:24. ARI – Chandler Catanzaro 21-yard field goal, 0:00. Cardinals 13–10. Drive: 12 plays, 72 yards, 5:05. LA – Brian Quick 4-yard pass from Case Keenum (Greg Zuerlein kick), 2:36. Rams 17–13. Drive: 5 plays, 19 yards, 2:33. With the win, the Rams started 3–1 for the first time since 2006. LA – Greg Zuerlein 37-yard field goal, 9:31. Rams 3–0. Drive: 12 plays, 60 yards, 5:29. BUF – Justin Hunter 4-yard pass from Tyrod Taylor (Dan Carpenter kick), 2:22. Bills 7–3. Drive: 12 plays, 76 yards, 7:09. BUF – Mike Gillislee 5-yard run (kick blocked), 13:59. Bills 13–3. Drive: 2 plays, 63 yards, 1:01. LA – Greg Zuerlein 32-yard field goal, 7:46. Bills 13–6. Drive: 5 plays, 52 yards, 2:33. LA – Todd Gurley 1-yard run (Greg Zuerlein kick), 1:56. Tied 13–13. Drive: 8 plays, 64 yards, 4:39. BUF – Dan Carpenter 23-yard field goal, 0:00. Bills 16–13. Drive: 10 plays, 70 yards, 1:56. LA – Greg Zuerlein 54-yard field goal, 8:05. Tied 16–16. Drive: 9 plays, 48 yards, 5:13. BUF – Nickell Robey-Coleman 41-yard interception return (Dan Carpenter kick), 3:54. Bills 23–16. LA – Greg Zuerlein 22-yard field goal, 5:51. Bills 23–19. Drive: 13 plays, 89 yards, 8:16. BUF – Marquise Goodwin 6-yard pass from Tyrod Taylor (Dan Carpenter kick), 2:37. Bills 30–19. Drive: 3 plays, 25 yards, 1:04. DET – Marvin Jones 7-yard pass from Matthew Stafford (Matt Prater kick), 10:44. Lions 7–0. Drive: 8 plays, 75 yards, 4:16. LA – Kenny Britt 20-yard pass from Case Keenum (Greg Zuerlein kick), 5:15. Tied 7–7. Drive: 10 plays, 75 yards, 5:29. LA – Case Keenum 1-yard run (Greg Zuerlein kick), 11:01. Rams 14–7. Drive: 11 plays, 84 yards, 5:51. DET – Andre Roberts 2-yard pass from Matthew Stafford (Matt Prater kick), 3:07. Tied 14–14. Drive: 14 plays, 75 yards, 7:54. DET – Anquan Boldin 4-yard pass from Matthew Stafford (Matt Prater kick), 9:50. Lions 21–14. Drive: 5 plays, 60 yards, 2:17. LA – Lance Kendricks 15-yard pass from Case Keenum (Greg Zuerlein kick), 6:33. Tied 21–21. Drive: 6 plays, 75 yards, 3:17. LA – Kenny Britt 9-yard pass from Case Keenum (Greg Zuerlein kick), 14:09. Rams 28–21. Drive: 10 plays, 80 yards, 5:47. DET – Golden Tate 23-yard pass from Matthew Stafford (Matt Prater kick), 6:02. Tied 28–28. Drive: 13 plays, 84 yards, 8:07. DET – Matt Prater 34-yard field goal, 1:29. Lions 31–28. Drive: 9 plays, 44 yards, 3:37. Case Keenum set a team record with 19 straight completions. He finished the game with 321 passing yards and four total touchdowns. With the game tied at 28, Matt Prater booted a field goal to lead Detroit 31–28. Keenum's day was ruined as his pass intended for Lance Kendricks was intercepted at the last second by the Lions, who would eventually win the game 31–28. LA – Tavon Austin 10-yard pass from Case Keenum (Greg Zuerlein kick), 11:15. Rams 7–0. Drive: 7 plays, 35 yards, 3:10. LA – Greg Zuerlein 36-yard field goal, 5:13. Rams 10–0. Drive: 8 plays, 62 yards, 4:32. NYG – Robbie Gould 29-yard field goal, 8:15. Rams 10–3. Drive: 14 plays, 71 yards, 6:38. NYG – Landon Collins 44-yard interception return (Robbie Gould kick), 7:10. Tied 10–10. NYG – Rashad Jennings 1-yard run (Robbie Gould kick), 9:23. Giants 17–10. Drive: 6 plays, 35 yards, 2:43. After scoring 10 points on their first two drives, the Rams could not score again as they allowed 17 unanswered points with a field goal, a pick 6 by Landon Collins, a 1-yard touchdown by Rashad Jennings. Case Keenum threw 4 interceptions in the game. One of the picks was on the last drive when the Rams drove down to the red zone. But a high pass landed in DRC's hands in the end zone allowing the Rams to drop 3–4 and continue on their losing streak. CAR – Greg Olsen 9-yard pass from Cam Newton (Graham Gano kick), 3:44. Panthers 7–0. Drive: 9 plays, 53 yards, 5:07. CAR – Graham Gano 38-yard field goal, 11:12. Panthers 10–0. Drive: 9 plays, 35 yards, 3:53. LA – Greg Zuerlein 25-yard field goal, 8:01. Panthers 10–3. Drive: 10 plays, 68 yards, 3:11. CAR – Graham Gano 37-yard field goal, 3:18. Panthers 13–3. Drive: 8 plays, 56 yards, 4:43. LA – Kenny Britt 10-yard pass from Case Keenum (Greg Zuerlein kick), 0:34. Panthers 13–10. Drive: 15 plays, 75 yards, 2:44. LA – Greg Zuerlein 20-yard field goal, 9:37. Rams 3–0. Drive: 12 plays, 73 yards, 5:23. NYJ – Bilal Powell 4-yard pass play by Bryce Petty (kick failed, wide right), 12:35. Jets 6–3. Drive: 9 plays, 99 yards, 4:06. LA – Greg Zuerlein 38-yard field goal, 0:20. Tied 6–6. Drive: 15 plays, 55 yards, 8:15. LA – Greg Zuerlein 34-yard field goal, 6:52. Rams 9–6. Drive: 10 plays, 36 yards, 4:00. With the win, the Rams improved to 4–5 without scoring a touchdown. This game was the Rams' only win in a series of 12 games, and their last win of the 2016 season, as they would go on to lose their remaining 7 games. LA – Todd Gurley 24-yard run (Greg Zuerlein kick), 9:47. Rams 7–0. Drive: 4 plays, 68 yards, 1:55. LA – Greg Zuerlein 46-yard field goal, 1:39. Rams 10–0. Drive: 10 plays, 49 yards, 6:05. MIA – Jarvis Landry 10-yard pass from Ryan Tannehill (Andrew Franks kick), 4:02. Rams 10–7. Drive: 8 plays, 77 yards, 2:38. MIA – DeVante Parker 9-yard pass from Ryan Tannehill (Andrew Franks kick), 0:36. Dolphins 14–10. Drive: 7 plays, 75 yards, 1:35. This game was the first time rookie quarterback Jared Goff made his starting debut for the Rams. The Rams held a 10–0 lead with just over 4 minutes left to play; however, the Dolphins would score 14 unanswered points to take a 14–10 win. With the loss, the Rams fell to 4–6. LA – Tavon Austin 24-yard pass from Jared Goff (Greg Zuerlein kick), 12:08. Rams 7–0. Drive: 6 plays, 75 yards, 2:52. NO – Brandon Coleman 3-yard pass from Drew Brees (Wil Lutz kick), 2:45. Tied 7–7. Drive: 9 plays, 51 yards, 4:33. LA – Kenny Britt 6-yard pass from Jared Goff (Greg Zuerlein kick), 14:43. Rams 14–7. Drive: 1 play, 6 yards, 0:04. NO – Mark Ingram Jr. 10-yard run (Wil Lutz kick), 9:38. Tied 14–14. Drive: 9 plays, 75 yards, 5:05. NO – Drew Brees 1-yard run (Wil Lutz kick), 7:46. Saints 21–14. Drive: 4 plays, 10 yards, 1:39. NO – Michael Thomas 6-yard pass from Drew Brees (Wil Lutz kick), 2:24. Saints 28–14. Drive: 8 plays, 78 yards, 3:45. LA – Lance Kendricks 15-yard pass from Jared Goff (Greg Zuerlein kick), 0:55. Saints 28–21. Drive: 8 plays, 79 yards, 1:29. NO – Mark Ingram Jr. 21-yard pass from Drew Brees (Wil Lutz kick), 12:58. Saints 35–21. Drive: 4 plays, 75 yards, 2:02. NO – Michael Thomas 21-yard pass from Drew Brees (Wil Lutz kick), 3:42. Saints 42–21. Drive: 7 plays, 92 yards, 3:17. NO – Tim Hightower 50-yard pass from Willie Snead IV (Wil Lutz kick), 10:15. Saints 49–21. Drive: 7 plays, 81 yards, 4:45. NE – LeGarrette Blount 43-yard run (Stephen Gostkowski kick), 10:38. Patriots 7–0. Drive: 8 plays, 80 yards, 4:22. NE – Chris Hogan 14-yard pass from Tom Brady (Stephen Gostkowski kick), 13:04. Patriots 14–0. Drive: 4 plays, 30 yards, 1:56. NE – Stephen Gostkowski 28-yard field goal, 0:11. Patriots 17–0. Drive: 13 plays, 48 yards, 5:19. LA – Greg Zuerlein 44-yard field goal, 7:50. Patriots 17–3. Drive: 8 plays, 29 yards, 4:55. NE – Stephen Gostkowski 44-yard field goal, 5:08. Patriots 20–3. Drive: 6 plays, 49 yards, 2:42. NE – Stephen Gostkowski 48-yard field goal, 3:06. Patriots 23–3. Drive: 6 plays, 13 yards, 1:56. NE – Stephen Gostkowski 45-yard field goal, 10:48. Patriots 26–3. Drive: 10 plays, 58 yards, 4:26. LA – Kenny Britt 1-yard pass from Jared Goff (Greg Zuerlein kick), 1:15. Patriots 26–10. Drive: 6 plays, 66 yards, 2:14. With the loss, the Rams were mathematically eliminated from postseason contention. This is Jeff Fisher's last game as the Rams' head coach before getting fired the next day. Todd Gurley after the game lashed out at the team for having a "middle-school offense." SEA – Luke Willson 8-yard pass from Russell Wilson (Steven Hauschka kick), 12:21. Seahawks 7–0. Drive: 13 plays, 93 yards, 6:47. SEA – Steven Hauschka 48-yard field goal, 8:45. Seahawks 10–0. Drive: 4 plays, 0 yards, 2:03. LA – Greg Zuerlein 36-yard field goal, 0:55. Seahawks 10–3. Drive: 8 plays, 51 yards, 3:39. SEA – Doug Baldwin 1-yard pass from Russell Wilson (Steven Hauschka kick), 3:12. Seahawks 17–3. Drive: 8 plays, 62 yards, 4:37. SEA – Tyler Lockett 57-yard pass from Russell Wilson (Steven Hauschka kick), 14:49. Seahawks 24–3. Drive: 5 plays, 67 yards, 1:43. SF – Carlos Hyde 19-yard pass from Colin Kaepernick (Phil Dawson kick), 9:01. 49ers 7–0. Drive: 2 plays, 17 yards, 0:37. LA – Todd Gurley 1-yard run (Greg Zuerlein kick), 4:07. Tied 7–7. Drive: 9 plays, 52 yards, 4:54. LA – Tavon Austin 30-yard run (Greg Zuerlein kick), 2:33. Rams 14–7. Drive: 1 play, 30 yards, 0:08. LA – Tyler Higbee 2-yard pass from Jared Goff (Greg Zuerlein kick), 10:32. Rams 21–7. Drive: 4 plays, 25 yards, 2:13. SF – Colin Kaepernick 13-yard run (Phil Dawson kick), 5:06. Rams 21–14. Drive: 13 plays, 75 yards, 5:26. SF – Rod Streater 10-yard pass from Colin Kaepernick (Colin Kaepernick run), 0:31. 49ers 22–21. Drive: 10 plays, 73 yards, 2:39. With the loss, the Rams fell to 4–11. They were also swept by the 49ers for the first time since 2013. ARI – Chandler Catanzaro 32-yard field goal, 10:34. Cardinals 3–0. Drive: 10 plays, 61 yards, 4:26. ARI – Chandler Catanzaro 34-yard field goal, 12:25. Cardinals 6–0. Drive: 6 plays, 19 yards, 2:07. ARI – Jeremy Ross 4-yard pass from Carson Palmer (Chandler Catanzaro kick), 7:42. Cardinals 13–0. Drive: 7 plays, 65 yards, 3:13. LA – Greg Zuerlein 37-yard field goal, 2:34. Cardinals 13–3. Drive: 9 plays, 56 yards, 5:08. LA – Greg Zuerlein 36-yard field goal, 0:48. Cardinals 13–6. Drive: 4 plays, 1 yard, 1:11. ARI – Chandler Catanzaro 47-yard field goal, 0:00. Cardinals 16–6. Drive: 7 plays, 46 yards, 0:48. ARI – Darren Fells 37-yard pass from Carson Palmer (Chandler Catanzaro kick), 13:11. Cardinals 23–6. Drive: 1 play, 37 yards, 0:09. ARI – Kerwynn Williams 1-yard run (Chandler Catanzaro kick), 8:17. Cardinals 30–6. Drive: 8 plays, 57 yards, 3:27. ARI – Larry Fitzgerald 5-yard pass from Carson Palmer (Chandler Catanzaro kick), 11:35. Cardinals 37–6. Drive: 6 plays, 19 yards, 1:48. ARI – Justin Bethel 66-yard interception return (Chandler Catanzaro kick), 8:06. Cardinals 44–6. With the loss to the Cardinals, the Rams finished their season 4–12. ^ "Rams, owner Stan Kroenke assert St. Louis better off as 2-sport city in Los Angeles relocation application". Retrieved 6 January 2016. ^ Breer, Albert (January 12, 2016). "Rams approved to relocate to Los Angeles". National Football League. Retrieved January 12, 2016. ^ "Rams headed back to Los Angeles; Chargers have option to join". ESPN. 13 January 2016. Retrieved 13 January 2016. ^ "2016 UK International Series schedule announced". NFL.com. November 25, 2015. Retrieved November 25, 2015. ^ "USC Requests No Monday Night Football Home Games For Rams". SBNation. Vox Media. Retrieved 15 April 2016. 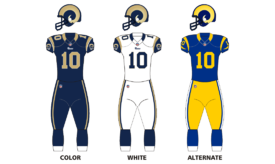 ^ "Los Angeles Rams will wear all-white combo for home games in 2016-17". SportsLogos.net. Demetrius Bell. Retrieved 11 August 2016.